No further individual items to suggest. We supply a range of eyes for a wide number of birds. Range of eyes for most common fresh and saltwater fish. 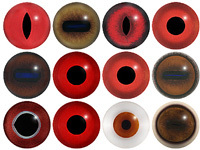 Human eyes with good pupil depth and iris colouration. 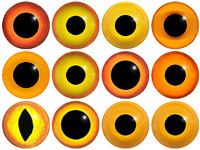 Lifelike eyes for dolls and toys. Plain black and painted Teddy Bear eyes. Blanks ready for you to paint yourself. 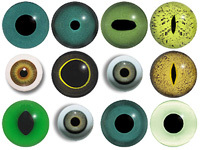 We offer a range of concave convez multi-coloured reptile eyes.